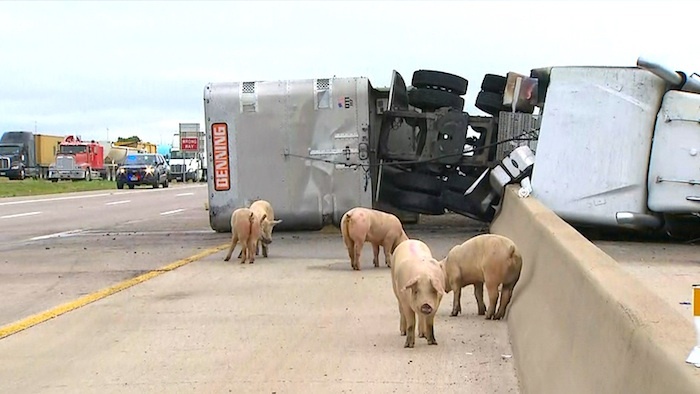 Interstate 45 in Wilmer, TX had its 15 minutes of fame on Thursday, after a bizarre accident involving a semi-truck left dozens of pigs running loose on the highway. Live video of the event went viral as officials chased down the pigs and were forced to close I-45 in both directions for over 10 hours. “The biggest challenge we’ve had so far was just corralling the pigs, keeping them from getting into oncoming traffic and getting ran over, but I do believe we’ve got all of them,” Lt. Eric Pon told NBC 5 from the scene. According to Wilmer Police, the incident occurred Thursday around 6:30 a.m. just as the morning rush hour commute began. While details of the crash have not yet been released, police have confirmed that an 18-wheeler transporting nearly 200 pigs was traveling southbound when it crashed into the median and flipped on its side. The overturned rig left pigs scattered all over the road and more pigs made their escape as the vehicle erupted in flames. Fortunately, the truck driver was able to make his own escape and did not suffer any injuries. The biggest problem for authorities was spending the next several hours chasing down dozens of pigs running loose on the highway. 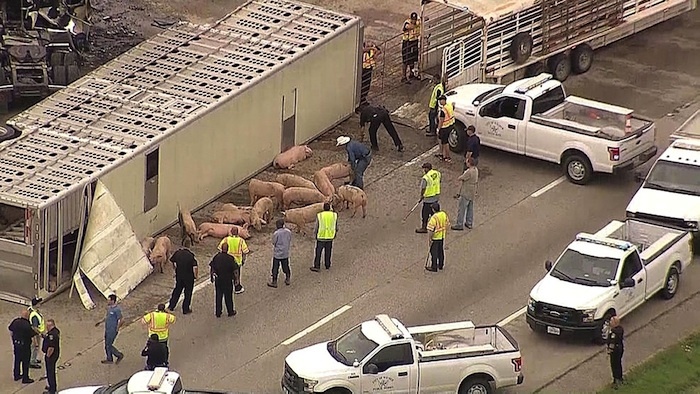 Both directions of I-45 were closed between Pleasant Run Road and Belt Line Road in Wilmer as law enforcement officials and volunteers rounded up pigs traveling in all directions, some making it as far as a half-mile away from the crash site. Police said that of the estimated 200 pigs on board, at least 15 died as a result of the crash. Firefighters helped to relieve the surviving pigs from the sweltering summer temperatures by spraying them with water. A second truck from the same company was sent out to transport the pigs to the Kennedy Livestock Center. While their freedom was short-lived, the pigs spent the rest of the day replenishing themselves by drinking lots of water, eating and frolicking in the mud to stay cool. Back at the crash site, officials were able to get the truck turned upright by 2 p.m. and HAZMAT workers were called in to cleanup the charred debris left scattered all over the road. The northbound lanes of I-45 were reopened by 11:20 a.m. and southbound lanes finally reopened by 3:30 p.m. just in time for the afternoon rush hour.